New statutory guidance on school uniform and pupils' appearance is to be introduced, the Welsh Government has promised. A consultation will be launched in the autumn which will focus on the affordability of uniforms. It follows the summer heat wave in which some parents claimed uniform policies were too strict. In some schools, boys were banned from wearing shorts and girls told to wear skirts or trousers. In June, a male sixth form student in Aberaeron hit the headlines when he wore a skirt to lessons in protest after being sent home for wearing shorts. Uniform policy is the responsibility of individual school governing bodies - and will continue to be so - but they currently refer to non-binding government guidelines. New updated and strengthened guidance will be issued for a three-month consultation later this autumn. 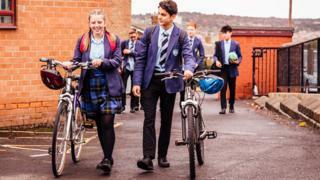 Education Secretary Kirsty Williams said: "Parents and carers face many different costs when it comes to school uniform as well as activities both in and outside of school. "Making school uniform guidance statutory is just one of the ways we can help reduce these costs." Meanwhile, Ms Williams has urged parents of children eligible for free school meals to apply to councils for a pupil development grant, worth £125 towards uniform, equipment and kit for sports and out-of-hours activities. These are available for primary reception class pupils, at the start of secondary school or aged four or 11 with special needs.